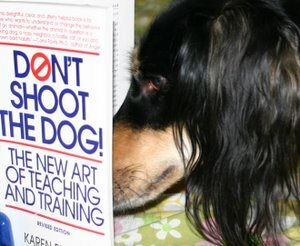 What Are We Teaching Our Pets? Our animals are learning from the moment of birth (and it’s very possible that they are learning even in the womb). They are born into a world of education that continues to their very last breath and, some say, beyond. How aware are we, when we bring our new family members home, that every moment of every day, in everything we do with our pets, we are teaching them? What behaviors are we likely to encourage if we’re not paying attention? Like human children, our pets watch everything we do. Dogs usually follow our actions more closely than cats, but don’t let a cat’s casual attitude lull you into thinking she doesn’t notice. When you think about it, that can be a bit intimidating. On the other hand, this can be used to our advantage. If we are consciously aware of how smart our animal family members are, we can watch for opportunities to mold their behavior. When you walk through the door and are greeted by the dog who jumps up on you, do you use that moment to teach the proper way to greet? Or do you edge around your leaping and panting friend, get your shoes off, and get dinner started — thus unwittingly encouraging the behavior? Even worse, do you pet him and praise him for being impolite? Try keeping a favorite toy just inside the door, but out of the dog’s reach. It will only take a moment longer to grab that toy, use it to lure your friend into a sit, and then reward him with the toy. Before you know it, you’ll be greeted by a happy dog, who sits politely in anticipation of his new game. Do you ask your pet to “say please” (by sitting) before you put her supper dish on the floor? Even a cat can learn to sit on request (all of mine have, anyway). It takes only a few extra seconds a day to turn dinner into an opportunity to build a routine of proper mealtime etiquette. Much negative behavior is reinforced when we’re not paying attention. We often inadvertently reward them (or fail to instruct otherwise) for behavior that, should we actually think about what we’re doing, we might prefer not to encourage. How often does the cat who howls at night get just what he is seeking (attention) when the owner wakes up and talks to or pets him to calm him down? Some cats even train their owners to get up and give them an extra meal in the middle of the night. We continue to reinforce that behavior, rather than nipping it in the bud right away. We have taught our cat that if he howls after midnight, we’re going to respond with a reward (even negative attention is still attention, after all). If we totally ignore kitty as soon as he starts this behavior, he’ll learn quickly that night time is for sleeping. Once the pattern has become ingrained, it can be much harder to break. I encourage you to pay close attention for a few days. Count how often simple interactions with your pets might be used to help them behave in a certain way. Are your actions reinforcing bad behavior, or good? What small changes can you make that will turn your daily routine into a series of training opportunities? After all, our pets teach us so very much. Let’s try to be more conscious of how much we teach them, in return. Although the March issue is a bit late, I’m pleased to be able to share it with you. Moving life-in-general from PC to Mac has been fairly seamless, though it has taken some time to get everything up and running. Thank you for your patience as I’ve returned to something resembling a normal routine!